The kitchen is the single most frequently used area in your home. Since this is the place where you and your family spend so much time in and you prepare your food in, it is vital that it is perfectly clean at any time. The aesthetics put aside, it is just much healthier that way. If you follow the tips listed below by Carpet Cleaning Hammersmith, you will have no problems having your kitchen cleaned and tidy at any time, without much effort. There are several things that you should make a habit of doing on a daily basis. They will not require more than several minutes each day, so you will not put unnecessary strain on your schedule. 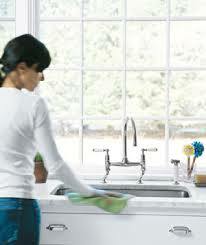 You should never forget to wipe the sink after you have washed the dishes or loaded the dishwasher. Also, wipe the stove top after cooking on it. The same goes for the oven. The kitchen counter is the last thing that needs wiping every day. Then you can proceed to vacuuming or sweeping the floor, which rarely takes more than two minutes. You can afford to spend more time cleaning your kitchen once a week. So when the weekend comes, do not waste a minute. Get down to work and mop the floor. After it has dried out, you can move to all cabinets, which need wiping and dusting. The dish rack is something that is often overlooked – do not do that, spend several minutes cleaning it. Pay attention to the insides of the garbage can – after cleaning it, you will notice that any bad odor in your kitchen has magically disappeared. There are things that can be done at the end of each season, meaning three to four times a year, which will still improve the conditions in your kitchen considerably. On a spring cleaning day for instance, you can empty the whole fridge and clean it inside out. Do the same thing with the utensil’s drawers and the cupboards. Do not forget to check the filter of the stove-hood. These activities take more time, but you will have to do them only once every several months, so there should not be any problem. Now you are finished. It may sound simple to have a perfectly clean kitchen at any time. The secret is that it is actually so – all you need is discipline and just a little spare time. This entry was posted in My Blog on May 16, 2012 by Rick Kuhn.